Hello, I’m so glad you stopped by! I hope your summer is in full bloom and you are relaxing and working on projects you put off till times were a bit slower. 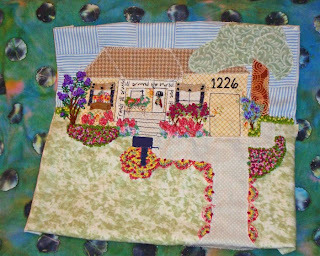 Today I finished a project I wanted to do for a long time…use fabric art and embroidery to reproduce the first home we lived in, posted about here shortly after we married. One the left blooming fabulously is a purple crepe myrtle. That goes with the Rose of Sharon on the other side of the house…the Rose of Sharon was already there as was the large tree. Daffodils now bloom on the walkway to the backyard. And a cluster of Wax Leaf Begonias bloom in pinks, burgundies with rich green and dark foliage. Under the large window two large rose bushes are ever blooming while just below are Pink Caladiums and Hydrangeas. 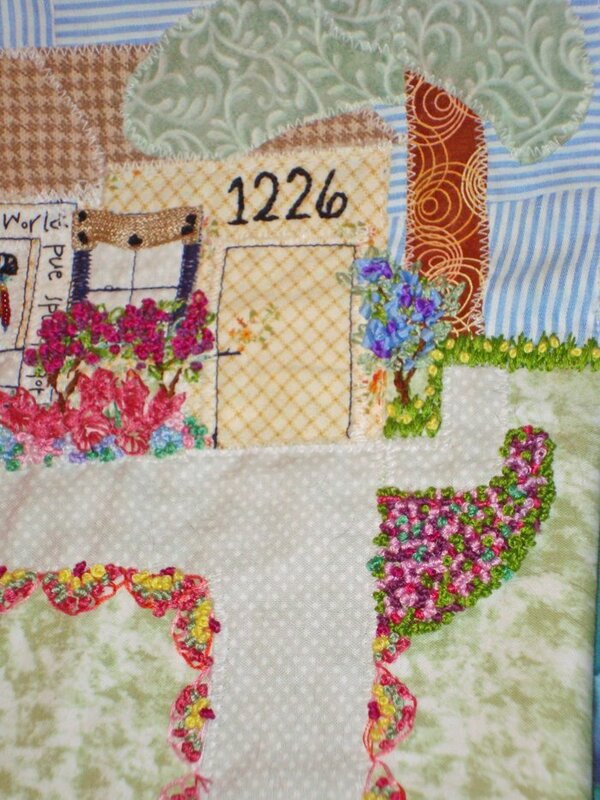 The window beside the crepe myrtle has a window box with yellow and orange flowers and greenery…that is when I stuck my finger with the needle and put my DNA at the top of the window, thus the awnings became a must. More Caladiums, Begonias and Hydrangeas grace that side of the house and on the porch, outlined in scroll work that I would add if we lived there today, is a large wicker plant holder holding a variety of Geraniums. Down the steps at the walk way is the Mail Box with our name and date of marriage that I moved up from the street. It is centered in Lantana with their blooms of peach, yellow and pinks…and they line the drive way as well. On the door is an upper window to let in light and below are Door Chimes, Colorful bells that I would have if living there today. Thank you for sharing this accomplishment with me! I hope you get to fashion something special you have wanted to do as well. 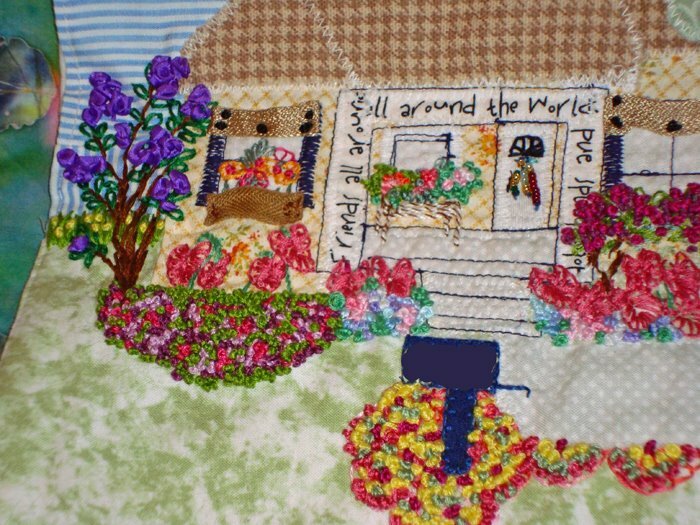 This entry was posted in Cottage, Embroidery, First Home. Bookmark the permalink.